Mussel Cottage is an old flint cottage right in the centre of Sheringham. It is situated in a yard of original fishermen’s cottages. It is on the site of where the first bomb fell in Britain during the First World War. The cottage is neat and immaculately presented, with comfortable seating and fresh crisp linen. It is well equipped and there is on street parking nearby. Alternatively you can purchase a weekly pass for the car park just a few minutes’ walk away. Mussel Cottage is a perfect Sheringham Holiday Cottage. No more than a few steps from everything you will need on your holiday! 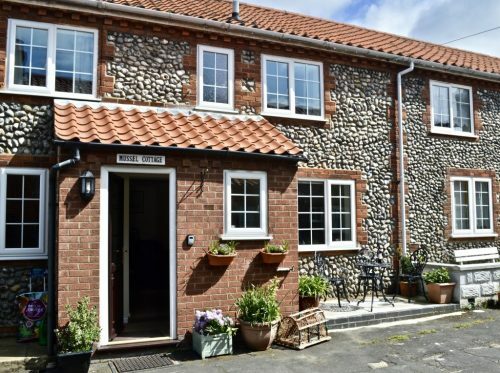 Mussel Cottage in Sheringham is a perfect base for a comfortable holiday, immaculately presented and clean as a new pin! Thank you, we had a wonderful stay in Mussel Cottage, everything we needed right our doorstep, we will be back! Perfectly positioned. Front door to small area for hanging coats and storing shoes. Kitchen – Well equipped with washer/dryer, microwave, fridge freezer, plenty of crockery, and glasses. Electric oven and hob. Dining Area – with dining table and chairs, bookcase with selection of games. Sitting Area – Comfortable leather reclining chairs make TV viewing and relaxing easy. Coffee table, TV with Freeview and DVD player, electric wood burning effect stove for instant heat on chilly evenings. Easy, not steep stairs to first floor. Bedroom 1 – Pretty room with a full sized single bed, side table and lamp and wardrobe. Bedroom 2 – Another charming room with King sized bed, bed side tables and lamps, dressing table and wardrobe so plenty of storage. Bathroom – Bath with shower attachment over, WC and basin. Outside – There is a pretty area with chairs and a table to sit outside in the evening or mornings. There is on street parking close by. The property is not suitable for dogs or children under 12. If you would like to book your parking for the week please click here to be redirected to the NNDC website. Please ensure you do this at least a week before arrival. Sheringham is a wonderful unspoilt Victorian seaside town, famous for being the home of the North Norfolk Railway webcam here which in September becomes the focus for the equally famous 1940s weekend which is attended by thousands of people every year. The railway hosts many events over the year which are always worth visiting. The carnival in August is another highlight of the year and is a lot of fun. Sheringham has a Blue Flag beach, a theatre and connections to National rail services through to Norwich.